About 18 months ago, I took the M101JS MongoDB for Node.js Developers. You can attend this kind of courses on university.mongodb.com (they launch a session about every three months). This time, I decided to attend the M102: MongoDB for DBAs and successfully completed. In this course, you’ll learn about replication, scalability, backups (where the 101 course was more about query optimisation, indexes …). I’m not a DBA, nor I pretend to be or become one, but I’ve been working in web development for some time now and always been working with databases. All the topics addressed are worth knowing if you ever have scalability in your applications (whether it’s at the DB layer or elsewhere). Here is a link to the notes I took from the course (it’s a github repo, you can contribute). M101JS MongoDB for Node.js Developers – completed ! 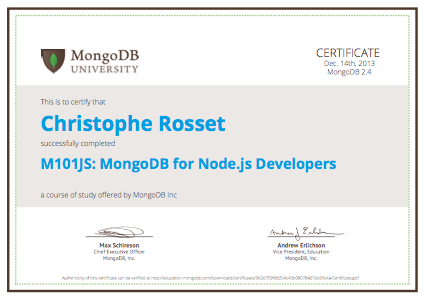 Today, I received my MongoDB certificate, after successfully completed the MongoDB for Node.js Developers course. This was very interesting, and the courses are very well made, so don’t hesitate (it’s free). I invite any developer who is a little into NoSQL to take it. There are different courses : developer / Java developer / NodeJS developer (some other are comming). PS : For developers who don’t know expressJS, it could even be a good introduction. 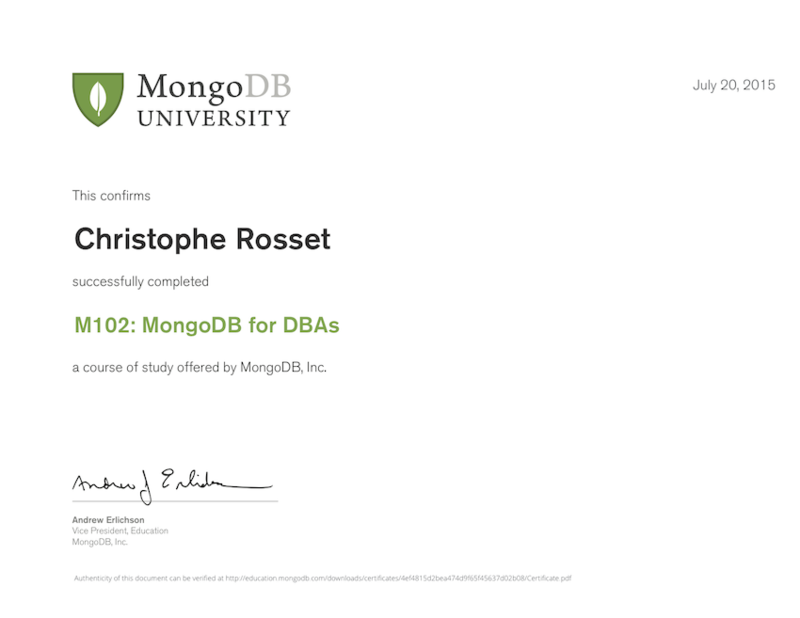 Update : I also completed the M102 : MongoDB for DBAs.